Martin Brodeur made his return to the New Jersey Devils, Thursday night in a 4-0 victory over the Colorado Avalanche. Martin Brodeur missed 50 games witha left elbow injury, which required surgery. When he was first injured, it was believed that he would not return until late March or early April. 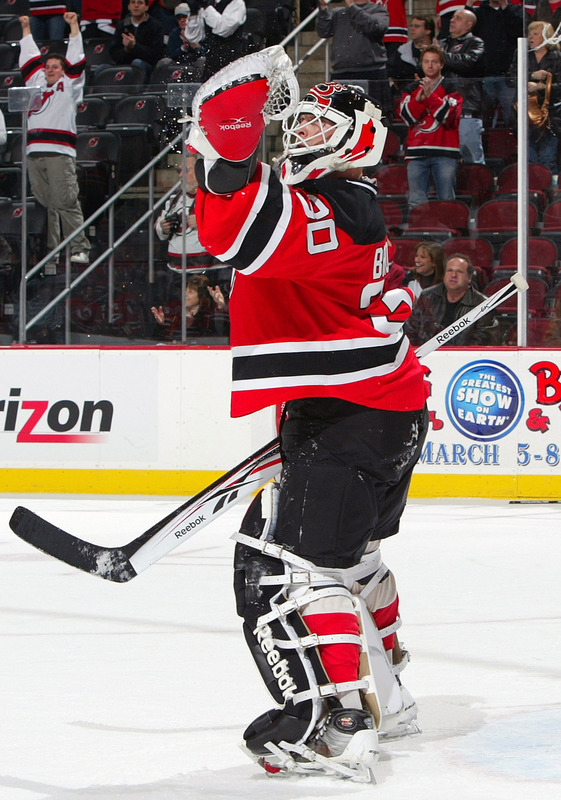 However, Brodeur had a very successful rehab and he recovered from his injury ahead of schedule. Instead of a late March return, he made a late February return. It has been over four months since the last time we saw Marty, and there were many questions going into Thursday night’s game. How would Martin respond? Will he still be able to make the spectacular glove saves he has been known for? Did he come back too soon? Martin Brodeur answered all of these questions and made his presence felt immediately. Throughout the Rock, there was a buzz; a buzz that hadn’t been there since November. When Marty took the ice for the pregame skate, the fans erupted and everyone gathered around to watch Brodeur take shots in the warm up skate. When the Devils took the ice again later that night for the game, the crowd went crazy once again and it set the tone for how the night was going to be. Every time Brodeur made a save he got a standing ovation from the crowd, and through out the game all you could hear was chants for Brodeur. 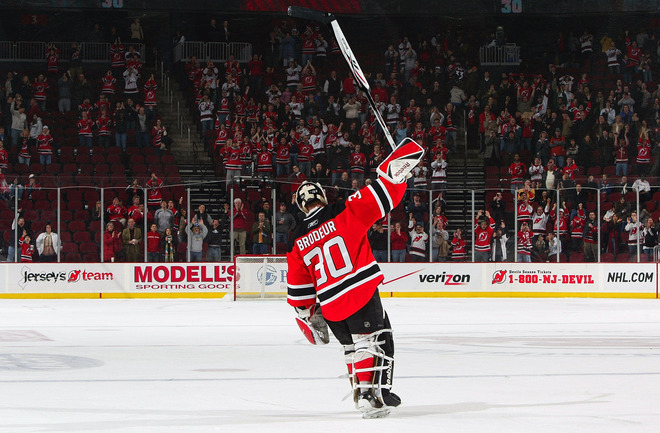 Overall, Martin Brodeur looked great for a player who had missed 50 games of the season. He proved that he did not rush to get back in the lineup and it appears that he is finally healthy. He made all the saves he needed to make and the Devils defense played great in front of Brodeur, as they did not allow the Colorado Avalanche many scoring opportunities. As for the spectacular glove saves, he wasn’t really tested too much in that area. The Avalanche really did not shoot glove side too much and they only managed to get 24 shots on net. Brodeur stopped all 24 shots and recorded the 99th shutout of his career as he won game number 545, making him only 6 wins away from tieing Patrick Roy for the most wins all time by a goaltender. Martin Brodeur was named the first star of the game and was greeted by a thunderous standing ovation, when he came out to salute the crowd. After the game, Brodeur told the press that the elbow felt great and that he didn’t feel anything during the game, even we he tested it. It was a great night and times are very exciting now for the New Jersey Devils, who many consider to be a legitimate cup contender now. Before the regular season is over, there will be a new all time leader in wins by a goaltender and possibly a new all time leader in shutouts. The man who will be holding these records will go down as one of the best goaltenders, if not the best goaltender of all time, is Martin Brodeur. Welcome back Marty. We missed you.